So on a hill above Tepoztlan is this pyramid. It is called El Tepozteco. It is a small temple to Tepoztecatl, the Aztec god of the alcoholic beverage pulque. To get there you have to hike uphill. It’s as hard as it looks. No. Harder. Starting in the city, at 5600 feet altitude, it’s a climb up some stairs and some big rocks, almost straight up 1500 feet. It was far and away the most challenging hike I’ve ever done. Multiple times going up I considered turning back. I stopped and rested dozens of times. I drank up both bottles of water I brought with me and wished I had more. Even getting an early start, around 9:00, when the temperature was still fairly cool, I worked up quite a sweat. The way down was very hard too. At least going up you can hold onto a rock as you step up. Going down you have only your feet to rely on. And my legs were like jelly, and my ankle is still very weak from my recent sprain. I actually slipped and fell twice, but fortunately no injuries were sustained. At the bottom, the trail connects with one of the main streets in the city. Along the way I stopped at a cute outdoor restaurant and bar (it was just after noon by this time). I had a few mojitos and a taco and sat and watched people walk by most of the afternoon. I don’t remember. It’s a blur. For dinner I went back to Los Colorines. Of course it’s never as good the second time, but it was still amazing. Next morning, I took one final walk to the zócalo. And I finally got a chance to see the Ex‐Convento Domínico de la Natividad. For some reason, I passed by multiple times and never noticed it, since it is semi‐hidden behind some walls. This gate is decorated anew every year using seeds. The monastery is just beyond. The monastery seems to have sustained some damage from the September earthquake. 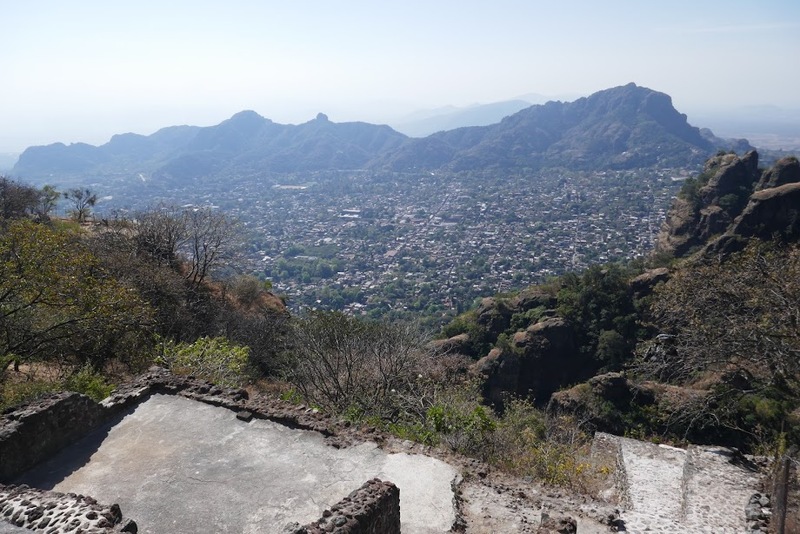 The epicenter was very close to Tepoztlan, but overall, the city came through okay. And then my ride came and whisked me off to Mexico City. Or as the locals call it, Mexico. Glad you got up and down without injury, silly man!